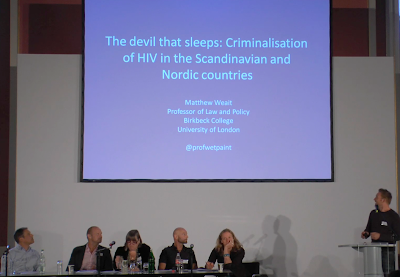 This international conference on the criminalisation of HIV non-disclosure, potential or perceived HIV exposure and non-intentional HIV transmission took place at the Rotes Rathaus in Berlin on 20th September 2012. HIV advocates, law and human rights experts and other concerned stakeholders – including parliamentarians, prosecutors, clinicians and representatives of UNAIDS and UNDP – shared information regarding the current legal situation in Europe and Central Asia and explored ways to ensure a more appropriate, rational, fair and just response. Video produced by Nicholas Feustel, georgetown media, for the HIV Justice Network. The conference took place on the occasion of the twentieth anniversary of the European AIDS Treatment Group (EATG). The meeting was co-organised with Deutsche AIDS-Hilfe (DAH), the International Planned Parenthood Federation (IPPF), and HIV in Europe, a multi-stakeholder initiative exchange on activities to improve early diagnosis and earlier care of HIV across Europe. Watch the video on the HIV Justice Network Vimeo site here.